Our data centre PVC curtains are available manufactured to order, there is no one size fits all when it comes to the retro or new fit out of your server rooms and data-racks. Our anti-static, flame resistant PVC strip is designed to create a containment seal around your rack space without introducing static and to effectively separate your hot and cold air aisles. The data centre PVC curtains have a crystal clear transparency (slight yellow tint), ensuring you can view and easily access your racks unhindered at every point along a row. Ensuring you achieve optimal energy efficiencies in your data centre environment, reducing temperatures and offering significant energy savings as a result. Our data centre PVC curtains can also be used as temporary blanking panels when servers need to be moved in and out in shared location facilities. The DK range of anti-static / flame resistant PVC strip curtains is an economical solution to area containment and hot / cold air separation in high end applications such as datacentres. 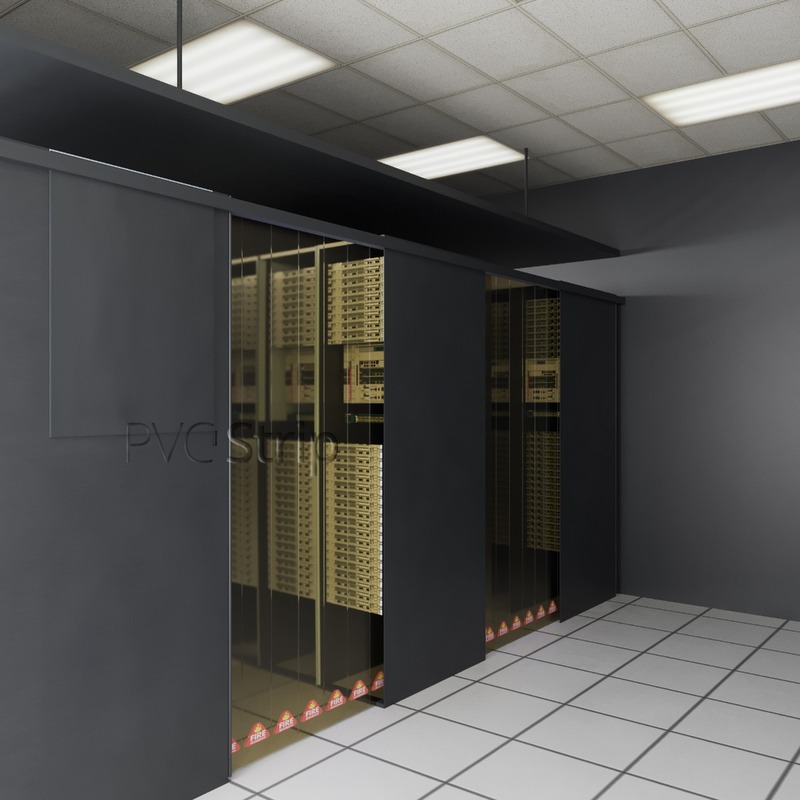 We use INEOS compound, high grade anti-static, flame resistant PVC strip (various widths and thicknesses) for datacentre applications that meet your containment requirements. We use specially designed suspension system that combines grey or black powder coated aluminium channels 2430mm long with pre fitted white bullet rails to ensure and optimised seal of the PVC strips. The Data-flex rail is pre drilled allowing for easy install at site regardless of your ceiling construction. The rails can be fitted directly into the ceiling or suspended on drops rods / wires from unistrut. Anti-static PVC will degrade over time. We recommend and use compound anti-static PVC strip, this means the entire product is extruded from anti-static PVC compounds which ensures you get the longest protection from the PVC product. Please note, “coated” anti-static PVC (green tint) will degrade very rapidly. All PVC is volatile and over time all “performance” PVC grades will degrade, however, we would estimate that “compound” vs “coated” will last approximately 10 times longer (depending on the environment in which it used and how frequently the PVC curtains are accessed). The product is more expensive in the initial instance but represents value for money in the long term. As a company we recommend applications requiring long-term anti-static ability use only compound products and our anti-static products (dependant on use) should be replaced annually. Grade of PVC required – is anti-static / fire retardant is required? If your PVC curtains dirty they should occasionally be wiped down with warm, soapy water. Do not use chemicals to clean this product as they can react and cause clouding / spots on the PVC. Ensure they are left hanging vertically when you wipe the strips down, if PVC is left in water it can cloud over time.